» Blog Archive » The Skidmore Bandersnatchers Rehearse! 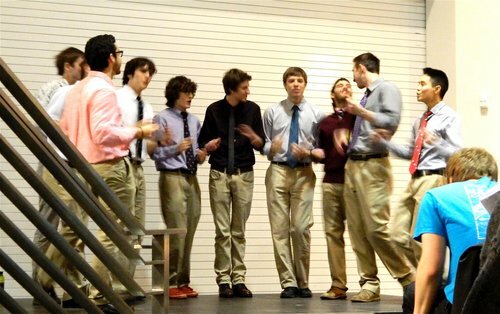 SARATOGA SPRINGS – Tuesday, Skidmore A Cappella group “Bandersnatchers,” rehearsed. It was their fifth rehearsal of the year and their fourth in Zankel Music Center. On the Skidmore College website, the rehearsal was listed as the #5 most important event on campus as it made the website’s front page scheduling plug-in. It is curious, though, that the rehearsal was listed on the website at all, let alone deserving of front page coverage, considering that Bandersnatchers rehearsals are closed to the public. Furthermore, they’re “reportedly” not that fun and mostly focus on singing A Cappella. Skidmore has long maintained an unhealthy, positive relationship with A Cappella and its beloved groups including the Sonneteers, Accents, Dynamics, and Drastic Measures. Oh, and Treblemakers, right. The Bandersnatchers next rehearsal (also closed to the public), will take place tonight from 7-9 PM at an undisclosed location on or around campus. This article is just feeding the conspiracy that Jon Wan is still alive and with the Banders. there’s a typo in the tag line. no academic integrity.